Antwerp has so much to offer… shopping, parks, restaurants, art galleries, the historic city center and… museums! The buildings of the Red Star Line Museum are carefully renovated and are part of the museum collection. Red Star Line is a relatively new museum telling the story of the shipping company, the city of Antwerp and its harbour, but above all, the emigrant’s stories. Definitely worth a visit!! What’s to be seen at the Red Star Line Museum? the buildings themselves are part of the collection. They were restored to their original condition and add to the nostalgic feel you get visiting this museum. permanent collection: through stories of passengers who travelled to America with the Red Star Line, you get to know the history behind this company. temporary exhibitions: in the shed you can find the museum shop and café and it’s also where you can visit the temporary exhibitions (for free). The MAS : museum and monument. The MAS (or Museum aan de Stroom) is so much more than a museum. It is a meeting place for locals and tourists. It offers a spectacular panoramic view on the city, you can enjoy a fine lunch or diner in the gourmet restaurant or a drink in the cosy museum cafe and you can of course visit the museumabout the city, the river and the port. The building of the MAS is a sight in itself. 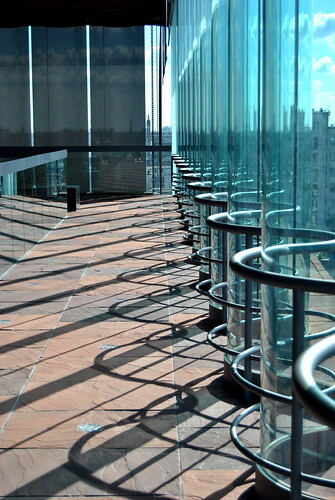 It has many architectural features like the rippling glass and a giant mosaic by Luc Tuymans. You can visit the building for free, but if you want to visit certain displays or exhibitions, you’ll have to pay an entrance fee. ‘Kijkdepot’: visible storage of artefacts. Display of power, prestige and symbols. Display of Life & death/Gods & mankind. Antwerp à la carte: a tasty history of the city. World port, trade and shipping: the history of the port of Antwerp. The Corner Shop: a colourful and diverse portrait series with images of Sanne De Wilde about the colourful history of Antwerp’s shops and shopkeepers. And this concludes the first post about museums in Antwerp. Which museum would you like to visit? Can you recommend another museum in Antwerp? Here you can read a post about ‘Het Eilandje’, the neighbourhood around the MAS. 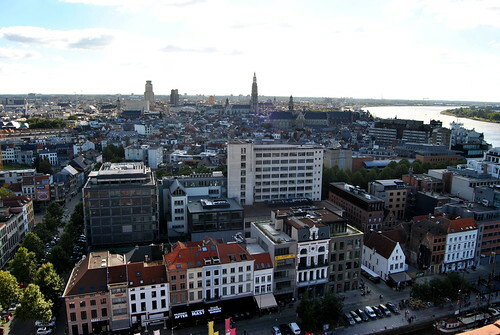 View from Antwerp, taken from the roof terrace of the MAS. This entry was posted in Belgium, Travel, Travel top tips and tagged antwerp, belgium, MAS, museum, Red Star Line, Travel, visitantwerp.